The UNEP chief said two years ago, no one thought air pollution was a big problem in India but now that is changing. 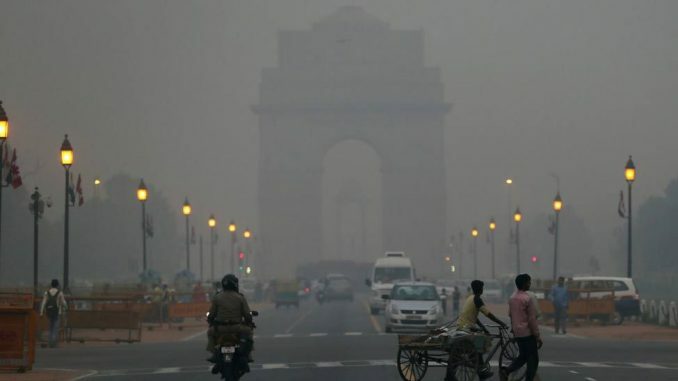 No one thought air pollution was a big problem in India two years back but this is changing “rapidly” now, UNEP chief Erik Solheim said, asserting that the country has “ambitious” visions on environment. India should enhance its actions in three areas, renewable energy, mobility and transforming the agricultural sector, the Executive Director of the United Nations Environment Programme (UNEP) said. Solheim is in India for a week. He stressed that India needs to “move fast” to tackle the issue of air pollution. “China and India are both countries with ambitious visions on environment. Yes, in recent years, China has moved quickly on air pollution, and I see India moving in that direction as well. “Two years ago, no one thought air pollution was a big problem in India, now that is changing, and rapidly,” Solheim said. Terming India’s efforts to fight air pollution in New Delhi and other big cities as “very encouraging”, he had earlier said that the country’s experience in harmonising development and environment protection is an example for the world. The air pollution in northern India, especially in Delhi-NCR, had reached alarming levels and even “emergency” levels last year. A report released by a green body in early 2017 had said that Delhi tops the list of 20 most polluted cities in the country where 1.2 million deaths take place every year due to air pollution. Another report recently said that around 47 million children in India under five years of age reside in areas where particulate matter levels exceed the prescribed limits, with 17 million among them inhabiting places where the pollution levels are twice the limits. Solheim said that India has more benefits in comparison to China, and the country under Prime Minister Narendra Modi has a “very clear” direction towards tackling the issue which is very “positive”. Speaking on the sectors which India needs to focus on, the UNEP chief said that focus on energy should be the number one priority to “spur solar and green revolution”. “I think I need to list two or three issues. Energy is number one to really spur the solar and green revolution. Second traffic, we need to do a lot more and move towards electric mobility but it must be based on domestic industry and transforming agriculture,” he said. In 2002, China introduced two metro systems and now has the biggest metro networks in the world, Solheim said. He pointed out that there has been a “sea change” as far India’s approach at climate negotiations are concerned. “I think there is a sea change. Ten years back India was so defensive in negotiations. Now India is taking a much more ‘front seat role’ and much more positive looking,” the UN official said. He had earlier also signed a letter of intent with Indian Union environment secretary C K Mishra on India hosting the World Environment Day on June 5, 2018. India will be the global host of the World Environment Day and the “Beat Plastic Pollution” theme.